Built for reliability and installation ease, the MagTek MagneSafe Mini secure reader utilizes a security architecture that combines MagnePrint Card Authentication, Host/Reader Authentication and Triple DES Encryption. The result is a solution ideal for retailers that need to meet PCI DSS certification. The MagneSafe Mini is 100% interface compatible with traditional MagTek magstripe readers while offering advanced security features such as data encryption, card authentication, and device/host authentication to be activated when security requirements demand it. It is the perfect solution for environments that want to "future proof" their platforms for long-term compatibility. 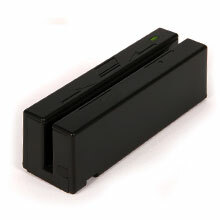 MagneSafe Mini, MagneSafe Card Reader (3-Track, USB, MSR, Mini) - Color: Black Please Call for more details.